Instead of operating relatively continuously like Class AB circuits, Class-D amps switch on and off thousands of times per second, delivering power only when needed. In other words, the amplifier is either fully on or fully off , which significantly reduces power losses from the output devices given off as heat. Less heat means our amps don't need massive heat sinks, and that means we can make them lighter. Our no-compromise design means the new PMP mixers will deliver full power with incredible fidelity all night long, without the need for lengthy rest cycles. When used in conjunction with switching-mode power supplies, which don't require huge and heavy transformers, our Class-D amplifiers provide tremendous dynamic punch and superior fidelity. The resulting speaker systems are much lighter, making them easy to transport and set up. The new generation of PMP mixers come equipped with 24-bit FX processors, giving you 100 mind-blowing digital effect presets such as delay, chorus and reverb. Apply them to any channel, as well as to the monitors and main output. In case you're pulling double duty as sound engineer and performer, the FX processors features a footswitch jack for remote on/off . Of course, if you have treasured outboard gear you've grown attached to, these mixers can integrate them into the mix while leaving out the built-in FX processor. Medium-sized events call for a lightweight (PMP6000: 13.1 kg/ 28.9 lbs; PMP4000: 0.4 kg/22.9 lbs; PMP1680S: 9.9 kg/28.8 lbs), easy-to-use powered mixer. 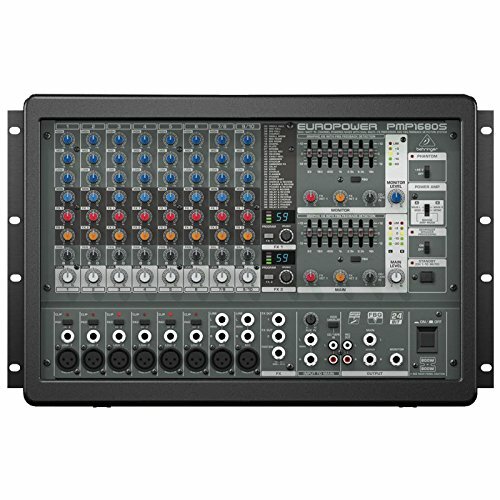 BEHRINGER powered mixers are the most efficient, affordable mixers for the job, and are even suitable for use as pure analog mixers or as pure power amplfiers. With new technological advantages and incredible built-in features, it's easier than ever to lend exceptional sound quality to all kinds of public performances.